Contact the editorial team at economicsandphilosophy@cambridge.org. The disciplines of economics and philosophy each possess their own special analytical methods, whose combination is powerful and fruitful. Each discipline can be enriched by the other. Economics and Philosophy aims to promote their mutual enrichment by publishing articles and book reviews in all areas linking these subjects. 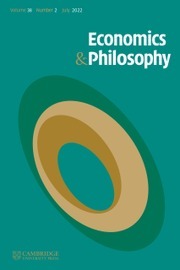 Topics include the methodology and epistemology of economics, the foundations of decision theory and game theory, the nature of rational choice in general, historical work on economics with a philosophical purpose, ethical issues in economics, the use of economic techniques in ethical theory, and many other subjects.